Like many kids growing up in the 1980s, I was terrified by the prospect of a nuclear war. But I also became fascinated by what would come after, in spite of the grim picture conjured up by the TV movie The Day After, the book The Fate of the Earth or the many other post-apocalyptic visions I have consumed right up through today (On the Beach, 28 Days Later, The Pesthouse). 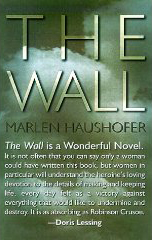 These works have survivors battle against mutants, disease or other survivors, and have more to do metaphorically with legacy or redemption, or literally with the effects of nuclear war, than they do with my true interest: absolute solitude.DUSTED OFF: “THE WALL” BY MARLEN HAUSHOFERFor that purpose, I have found nothing so satisfying as The Wall, Austrian author Marlen Haushofer’s splendid 1962 novel (English translation published in the U.S. by Cleis Press, 1990). The unnamed protagonist awakes one morning to find the entire mountainside where she is staying encircled by an invisible wall. Judging by indicators such as the lack of any aircraft, she surmises that the world has been silently destroyed and she is the only survivor. Rather than fighting off enemy legions, she struggles with feelings of futility, a toothache, planting and harvesting, and the responsibility she feels towards the animals that have fallen into her care. A beguiling incident of violence recounted at the end of the book is what prompts her to begin writing a report of her 2½ years (and counting) within the confines of the wall.